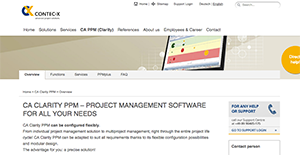 CA Clarity is a Project and Portfolio management (PPM) platform that helps businesses effectively and efficiently manage their products, services, peoples, and finances. The platform is aimed to facilitate and improve the delivery of projects and programs. With CA Clarity, companies are able to devise and execute sound strategic investments and business decisions. The solution helps users follow and prioritize the right market and customer requirements, allowing them to invest their resources as well as maximize their enterprise, IT, service and product portfolios. CA Clarity PPM has proven to be an effective product that can be implemented by any business size in any industry. The system can be deployed as an on-premise solution or as a cloud-based service with both a hosted and SaaS delivery option. It can be accessed via a web browser as well as mobile devices with an internet connection. CA Clarity PPM enables companies and organizations to put their portfolio of resources, projects, and budgets into a more centralized setup and effectively manage each aspect using scorecards to objectively analyze and compare requirements across the complete portfolio. The solution encourages financial transparency as users are granted time control of billing, invoicing and charge back allocations making management more effective in handling budgets for more enhanced cash flows. CA Clarity also provides support for project control, with users getting the right tools to effectively manage schedules, status, and costs. Management personnel can also view each project and make sure that qualified individuals are assigned to their tasks to deliver the best project service in a timely manner. Companies have access to the information they need to make in-depth analysis of their application portfolio, allowing them to come to smart decisions on development, investment, consolidation, or retirement of these applications. CA Clarity helps users in establishing portfolio standards and metrics to help them assess their portfolio investments against business indicators, including ROI, break even analysis, revenue enhancement, quality improvements and other relevant statistics. Clarity PPM also comes with an integrated KPI tracker built with several pre-defined KPIs as well as an advanced Analytics module for deeper analysis and performance monitoring. Overall, Clarity PPM brings to the table capabilities and functionalities that allow companies to make better decisions regarding their portfolio and help them align their business strategies and market requirements to help attain their goals, while remaining cost effective without compromising the quality of the delivery of project service. It's important to keep in mind that virtually no service in the Enterprise Project Management Software category is a perfect solution that can fulfill all the needs of different business types, sizes and industries. It may be a good idea to read a few CA Clarity reviews first as some software may perform well just in a very small group of applications or be designed with a very specific industry in mind. Others may work with a goal of being simple and intuitive and consequently lack advanced features needed by more experienced users. There are also apps that cater to a wide group of customers and offer a powerful feature set, however this in most cases comes at a more significant cost of such a service. Be certain that you're aware of your requirements so that you choose a software that has exactly the features you search for. How Much Does CA Clarity Cost? We realize that when you make a decision to buy Project Management Software it’s important not only to see how experts evaluate it in their reviews, but also to find out if the real people and companies that buy it are actually satisfied with the product. That’s why we’ve created our behavior-based Customer Satisfaction Algorithm™ that gathers customer reviews, comments and CA Clarity reviews across a wide range of social media sites. The data is then presented in an easy to digest form showing how many people had positive and negative experience with CA Clarity. With that information at hand you should be equipped to make an informed buying decision that you won’t regret. What are CA Clarity pricing details? What integrations are available for CA Clarity? If you need more information about CA Clarity or you simply have a question let us know what you need and we’ll forward your request directly to the vendor.